For patients that would like to get rid of those loose, uncomfortable, and bulky dentures, there is a very nice, and surprisingly affordable, solution for you. The All-on-4 Dental Implant Procedure uses four implants to support replacement teeth for the entire upper or lower arch. 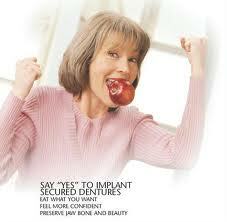 This is usually able to be done without the need for any bone grafting. These special dental implants, developed by Nobel Biocare, are able to support the immediate fitting of fixed replacement teeth. This type of treatment is highly beneficial for patients currently wearing dentures that would like to improve the quality of their life. Even if you have many failing or hopeless natural teeth still present, the All-on-4 procedure could be the perfect solution for you. Qualified patients will receive four implants and a full arch of new replacement teeth in just one or two treatment appointments — without any bone grafting! 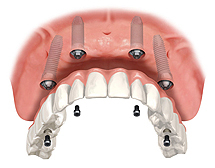 The upper teeth fixed to implants in this way eliminates the need for the palate area of a conventional denture. This allows the patient to be able to taste and enjoy food as they could when they had their own natural teeth. Additionally, the bulky excess acrylic normally covering over the front and sides of your gums with a regular denture, is also no longer necessary. Some other obvious advantages of this procedure are the elimination of loose and uncomfortable dentures or partials, as well as no more sticky adhesives. The implants can be placed on one day, then the very next day you will have a beautiful, fixed, and fully functional set of replacement teeth. Traditional approaches to restoring a full arch usually involves extensive bone grafting, many more implants surgically placed, and very long periods of treatment. This means that patients are often without any teeth, or with uncomfortable and ill-fitting temporary dentures for more than a year. With the All-on-4 dental implant procedure, the patient has one or two visits to the office to allow Dr. Williams to use x-rays, impressions, and photographs to put together a treatment plan. Following this consultation, the patient is scheduled for a full day appointment where the implant surgery and the new teeth are fitted and adjusted, all in one appointment, even when multiple extractions are necessary. The patient will return for occasional check-ups over the next several weeks and months. 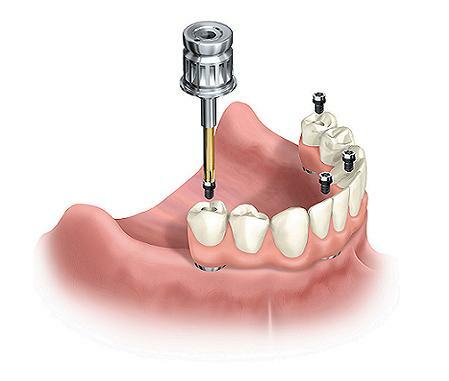 After six months, once the gums have healed, and the implants have fully integrated to the jawbone, new impressions of the patient’s mouth will be taken. At that time, the final, stronger, perfectly fitting permanent set of teeth will be completed.